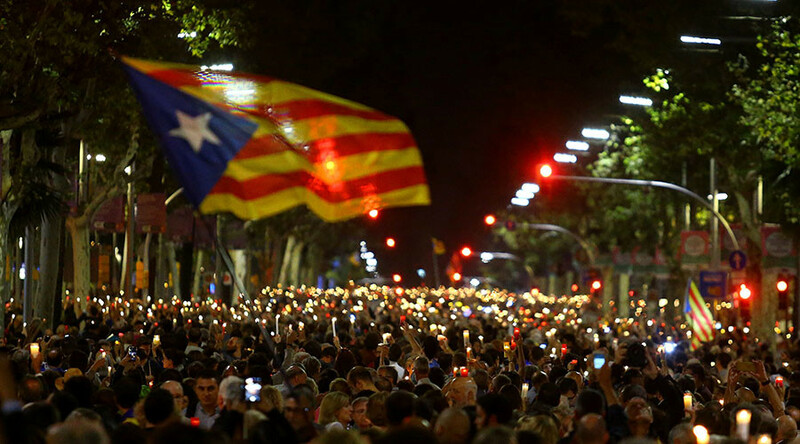 Catalans took to the street of Barcelona for a candlelit march in support of the two leaders of the separatist movement who were detained by the central Spanish authorities on suspicion of sedition in the aftermath of the independence referendum, deemed illegal by Madrid. 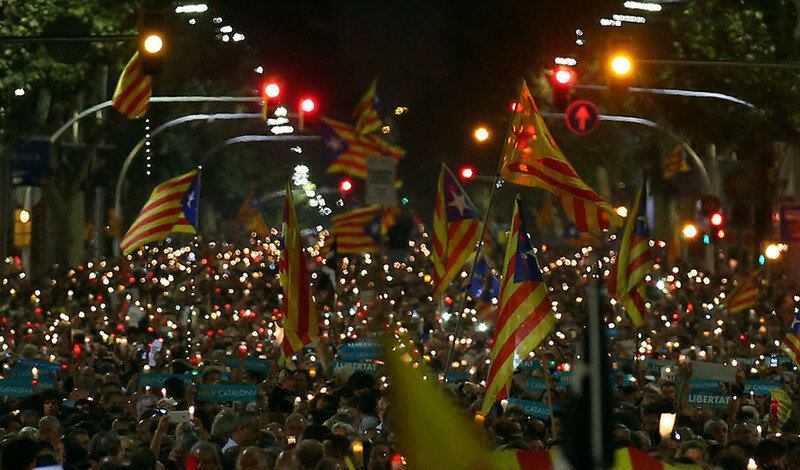 Tens of thousands of protesters marched through the streets of Barcelona on Tuesday evening to show support for Jordi Sanchez, leader of the Catalan National Assembly (ANC), and Jordi Cuixart, of the Omnium cultural association, who were detained on the orders of Spain’s High Court. The protesters demanded that the central Spanish government release the men, who they referred to as “political prisoners.” Sanchez and Cuixart were remanded in custody without bail on Monday. The two men, alleged by the prosecution to be the masterminds behind the October 1 referendum, will remain in custody while the investigation into sedition allegations goes on. The Catalan government condemned the arrests and urged Madrid to release the two pro-independence leaders. Catalan officials took part in the rally in support of the duo. A spokesman for the Catalan government called the jailed activists “militants of pacifism, democracy, freedom and Catalonia,” sharing an aerial photo of the rally on his Twitter account. The arrest of the two separatist leaders was condemned by WikiLeaks co-founder Julian Assange, who is known as a vocal supporter of Catalan independence. Assange claimed that Spain has created its “first high-level political prisoners” with this move. Two high-profile Catalan police officials, Major Josep Lluis Trapero, and Lieutenant Teresa Laplana, were also questioned by Spanish law enforcement officials on Monday, but unlike the Catalan independence activists they were not detained. The officers, however, were ordered to appear in court every two weeks and to surrender their passports.